This plant, named after Brisbane, Australia, hails from that part of the world and has some unique characteristics that distinguish it from some others we've worked with. 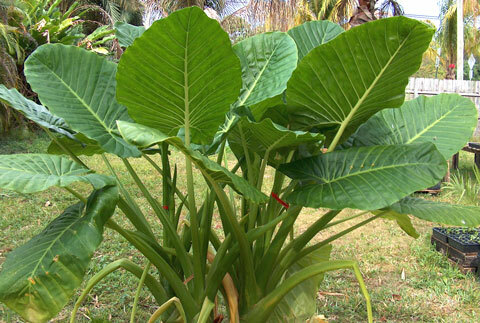 The plants are quite vigorous, responding very well to plenty of water and fertilizer by growing at least a leaf a week in the summer months. This plant is not a "giant" grower, but does grow quite rapidly. 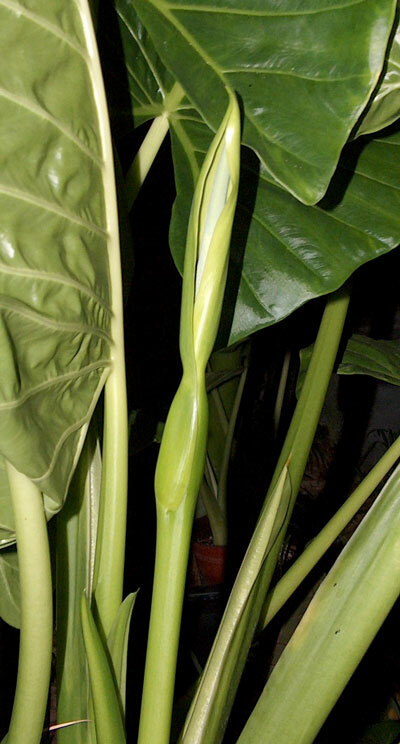 The spadix is a light green in color when the spathe first unfurls, and the swollen area around the pistil section of the spadix is much larger (as is the pistil area) than is typical in most other Alocasia inflorescences we have worked with. The exterior surface of the spathe is shiny, as contrasted with the matte look of the spathes of A. odora. We obtained this one last year in mid-summer as a large stem piece sporting what looked then to be a few scrawny sprouts emerging. Those sprouts grew rapidly to overflowing a 15 gallon nursery pot with 5 very large plants, all of which have gone into a blooming cycle. So far the plants has produced no pups for us. One distinctive characteristic of the inflorescences is their delicate perfumy odor, unlike the aromas given off by inflorescences of other Alocasias we've sniffed. The inflorescences, once opened, can last for nearly two weeks in cooler weather. During this time the inflorescence is open, the spadix changes from green to orange-brown, and the spathe changes from green to yellow.